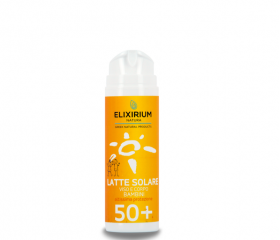 Elixirium Natura :: ELIXIRIUM NATURA - SUN PROTECTION FACE AND BODY MILK SPF 50+ FOR CHILDREN. HomeElixirium NaturaELIXIRIUM NATURA - SUN PROTECTION FACE AND BODY MILK SPF 50+ FOR CHILDREN. ELIXIRIUM NATURA - SUN PROTECTION FACE AND BODY MILK SPF 50+ FOR CHILDREN. 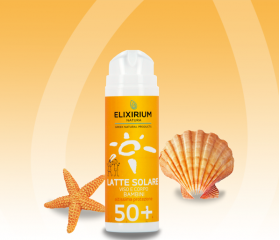 Creamy and delicate emulsion, formulated with a combination of physical filters and chemical filters, that effectively protects the skin of the child from UVA and UVB rays. It carries out an action moisturizing, emollient and protective thanks to active ingredients such as Vitamin E, Aloe Vera, Oil of Apricot and Allantoin. Blueberry and Chamomile they act as soothing and anti-reddening agents. Suitable for the first sun exposures, for skins thin, sensitive, clear, delicate and subject to redness.